We, moms like our kids to develop a habit of reading, the reason why we encourage them to start to like books and other reading materials while they are young. I am really proud to say that my son is an avid reader. Despite having gadgets and game consoles, Yahmir would rather bury his nose in adventure filled young-adult books especially the Percy Jackson Book Series. 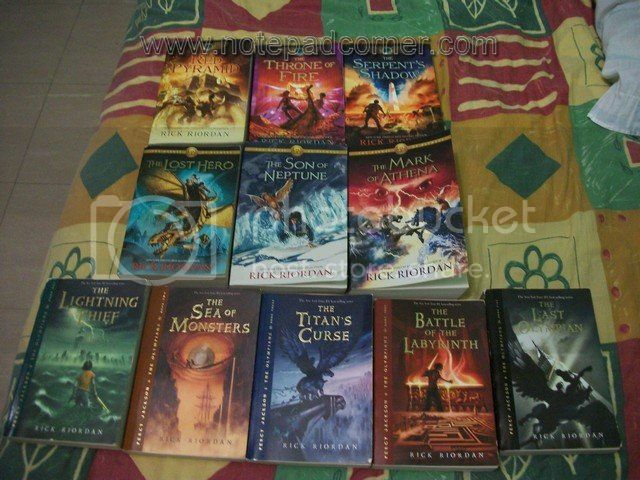 You cannot deny his being a huge Rick Riordan fan having the almost all the books in the series. He’s currently waiting for the next book, The House of Hades which is to be launched on October 8 of this year. Why have the series hit off with my teen? Greek mythology is a staple discussion in high school. I know most teens would find it boring, but with Rick Riordan’s rendition and creativity, he gave mythology a whole new dimension! Reading some snippets from Yahmir’s books also got me hooked and eager to read the whole series too. Percy Jackson is not your average boy-next door hero; in fact he is just like any other boy who has faults and limitations. Yet he achieved and experienced unbelievable adventures! Rick Riordan’s books are not only packed with adventure that will hook you on, but it is also filled with reflections that would eventually help young adults develop stronger values as they grow older.